Have you had more than enough of the dark days of winter yet? Here is the perfect card to lift your spirits, whether you are creating it or receiving it! These colors make me smile! Flirty Flamingo, Bermuda Bay & Lemon-Lime Twist. The flamingo, leaves and pineapple are from the stamp set Pop of Paradise, an oldie but a goodie! The words are from the Sunshine Sayings stamp set and matching thinlits. The card base is Thick Whisper White, the mat is Basic Black 4" x 5-1/4", and the card front is 3-7/8" x 5-1/8". 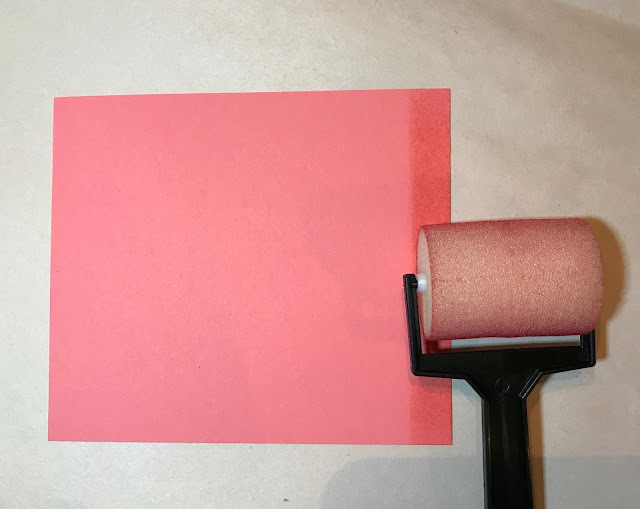 This lovely ombre effect was created with my sponge brayers simply by rolling some Calypso Coral ink directly from my inkpad onto Flirty Flamingo cardstock before die-cutting the "sunshine". To get two colors on the pineapple, I inked the bottom of the stamp on my Lemon Lime Twist ink pad then colored the top with my Bermuda Bay Stampin' Write marker. A little bit of the Lemon Lime was on the top of the pineapple so it created a nice blend between the two colors when I stamped it. "Sending" & "& Hugs" was stamped in Versamark on a 1/2" strip of Basic Black cardstock then sprinkled with white embossing powder and heat set. I used a black Stampin' Write marker on the flamingo's beak. The blingy sequins are self-adhesive!!! I love these things - no more fighting with glue dots on the back of sequins. I'm hoping these are so popular that Stampin' Up makes them in more colors in the future!